← BEAT – The story of a former Newark Detective delivering the real. Five or six years ago I had a desire to create deliberate groups of free-standing paintings, tableaux composed of elements varying in size and structure, made to be seen together. “Pointing Fingers” surprises me by fulfilling that idea through the coincidence of a chance invitation to exhibit in a window and an unforeseen pulling together of what I thought were individual works. But this installation in a store-front window is in fact comprised of more than my standing paintings and their placement. It is also the effects produced by the interfering, overlapping layers of individual pieces, reflections of the street on the window glass, and idiosyncrasies of the surrounding buildings. There is something new for me in the acceptance of this degree of blurry complexity. My work is usually matter-of-fact in its organization, stressing clarity and distinctness, though it often includes obtuse reversals. In keeping with the mode of direct clarity, the individual pieces in this group use conventions of form related to geometric abstract art and minimalism, like the grid. But clustering the works tightly together means the overall complicated mass of the group is seen first, before discreet statements of the various pieces. Outside and above the window a rusty construction scaffold shades the sidewalk, and the metal poles supporting it rhyme with the grids in the paintings, confusing inside and outside. The window itself has a metal pull-down gate which is visible even when open. The whole installation exhibits permeability to its environment. 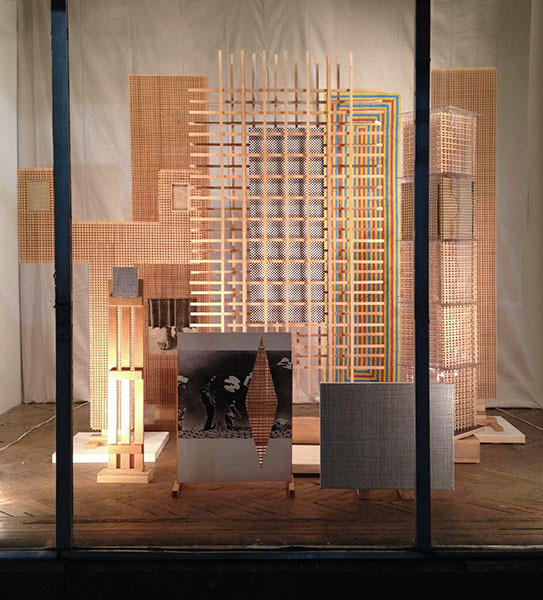 The group of wooden lattice-based paintings of various shapes seems to find relationship to layered textures of the street outside and the look of ongoing construction/destruction in downtown Newark. Besides human figures, the standing pieces evoke commercial display, which is of course what’s expected in a storefront. They stand like mannequins or furniture for sale. The building was once a furniture store and existing businesses on the block are still that, with cheap but ornate chairs and tables on view in adjoining windows. I hung floor to ceiling unpainted raw canvas behind and around the work in the window suggesting a kind of open shelter for the clump of paintings. The hanging canvas creates a narrow passage to the right, outside the roughly cubic space inhabited by the paintings. This dark passage, about a foot wide, leads to a partially visible but inaccessible “backstage” area. Implied but hidden space like this was a frequent part of my earlier paintings and in its theatricality here reminds me of a “there-but-not-there” space in David Lynch’s film “Inland Empire”.